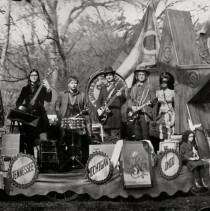 The Raconteurs are pleased to announce the following North American tour dates. You want tickets before they go on sale to the public this weekend? Tomorrow, March 20th, at 10 am local time, you can visit the following links to buy your tickets before everyone else. Please note they are on a first come, first served basis and you’ll need the special password which is “consolers“. Don’t forget to pick up your copy of the new album, “Consolers of the Lonely”, which will be available everywhere (including digitally at theraconteurs.com) on Tuesday, March 25th. Also, stay tuned for more UK/Europe dates to be announced in the near future. Full tracklist for Consolers of the Lonely after the jump.